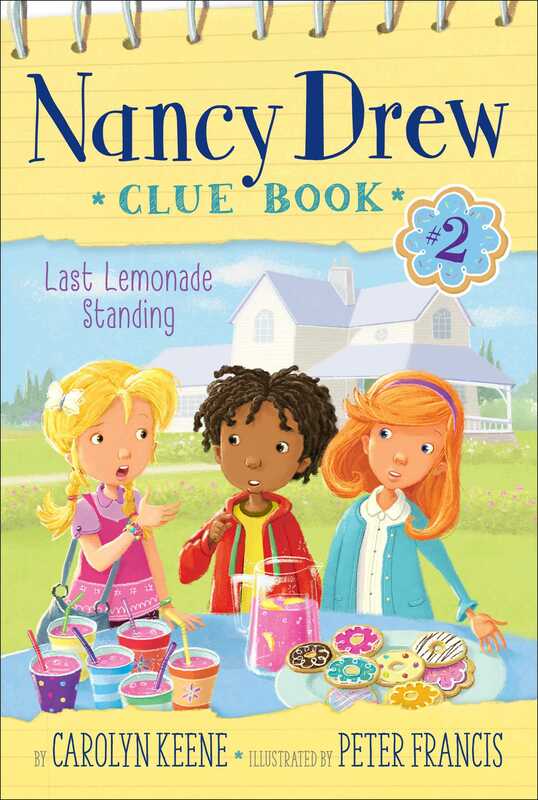 Help investigate the case of a missing lemonade recipe with Nancy and her friends in the second book in an all-new, interactive Nancy Drew chapter book series. Includes space for readers to jot down their own ideas and solutions to the case! Nancy, Bess, and George want tickets to see pop singer Katy Sloan play at the River Heights Amusement Park—but their parents say they’ve already filled their summer theme-park quota. So the girls decide to turn lemons into lemonade by earning their own tickets—with a lemonade stand! Unfortunately Lily Ramos, a new girl in River Heights, has the same idea. She’s the niece of the owner of the town’s newest and hottest café, and her stand is equipped with café tables, gourmet treats, and a rolling library cart! Good thing Nancy has a secret weapon: Hannah’s family lemonade recipe! The girls are all set to whip up the lemonade—until the recipe is replaced by a blank sheet of paper! Nancy, Bess, and George set out to find the thief! Could it be Lily, whose stand may be fancy but whose lemonade is totally yucky? Or a sneaky contestant on Ready, Set, Cook!, the hot new kids’ cooking contest show? It’s up to the Clue Crew—and you—to find out! Nancy sat with her two best friends behind their lemonade stand. The table holding a pitcher of lemonade and paper cups was set up in the Drews’ front yard. “Maybe it’s too hot,” Bess Marvin suggested. Nancy counted the few quarters and dimes in a glass jar. She then wrote the total on her favorite writing pad with the ladybug design. Bess and George sighed too. Katy Sloan was their favorite singer. When they had heard that Katy’s next concert would be at the River Heights Amusement Park, they knew they had to go. But Nancy, Bess, and George had already gone to the amusement park twice that summer to ride the rides. Both times their parents had paid for the tickets. So they would have to buy these tickets with their own money. That’s when Nancy had the idea for a lemonade stand. They even taped a picture of Katy to the table to make them work harder! Bess had written the date of the concert right on it. “We’ve been selling lemonade for two whole days,” Nancy said. Nancy glanced over her shoulder at her house. “Top secret?” Bess said, her blue eyes wide. “Then why won’t she give you her recipe?” Bess asked. When Nancy, Bess, and George weren’t selling lemonade they were part of a detective club called the Clue Crew. Nancy even had a special Clue Book so she could write down clues and suspects. “Are you sure you two are cousins?” Nancy joked. Bess and George were cousins, but totally different. Bess had blond hair, blue eyes, and a closet full of fashion-forward clothes. George had dark hair and eyes and liked her nickname better than her real name, Georgia. George’s closet was full too—with electronic gadgets! “What does it do?” Nancy asked. “You guys, look!” Bess interrupted. Nancy turned to see where Bess was pointing. Walking toward their lemonade stand were Andrea Wu, Bobby Wozniak, and Ben Washington from their third-grade class at school. The kids approached, each wearing a ready, set, cook! T-shirt. Nancy was surprised to see Bobby on the team. Bobby’s nickname was Buggy because he loved bugs! “You like to cook, Buggy?” Nancy asked. “How about some lemonade?” Bess asked. “I’d rather have bug juice!” Buggy sighed. “I’ll have a cup, please,” Ben said with a smile. “One cup coming up!” George said. She picked up the pitcher and carefully poured lemonade into a paper cup. Ben drank it in one gulp. “You tasted all that?” Nancy exclaimed. “Wow!” George said. She offered Andrea a cup, but she shook her head. Nancy, Bess, and George knew Lily from school. They also knew that Lily’s Aunt Maria owned a chain of famous coffee-and-tea cafés called Beans and Bags. “What’s Lily’s lemonade like?” Nancy asked. The girls traded surprised looks as Team Lollipop walked away. “What could be so special about Lily’s lemonade stand?” Bess wondered. Nancy wrote BE RIGHT BACK on her ladybug pad. After putting the lemonade pitcher in the kitchen fridge, the girls made their way to Lily Ramos’s house two blocks away. Nancy, Bess, and George each had the same rule: They could walk anywhere as long as it wasn’t more than five blocks away and as long as they were together. They didn’t mind. Being together was more fun anyway! “Whoa!” George gasped when they reached the Ramoses’ front yard. Behind Lily’s lemonade stand were cushy chairs and a rolling book cart for customers. There were board games on tiny tables and a FREE WI-FI sign. When Lily saw Nancy, Bess, and George, she smiled. “This is your lemonade stand, Lily?” Nancy asked. Nancy watched as Lily’s six-year-old cousin strolled by, playing “Twinkle, Twinkle, Little Star.” She then noticed something else. The prices of the lemonade, cupcakes, and cookies were written on the same ladybug paper she owned. But when they tried Lily’s lemonade, their faces puckered up. Andrea was right about something else—Lily’s lemonade was too sour! “Don’t you like it?” Lily asked. “Um . . . it just needs a little something,” Nancy said nicely. “It’s just that we have a lemonade stand too, Lily!” Bess said quickly. “And your lemonade is better than mine?” Lily cried. Lily was still frowning as she left to help a customer. But as the girls walked out of Lily’s yard, they were frowning too. Nancy gave it some thought. There was only one way to bring customers to their lemonade stand. “We need the most awesome lemonade in the whole world, that’s how!” Nancy announced. “Where are we going to find that?” Bess wondered.